Gas grills are really popular due to their quick heating up time. Gas grills typically get up to temperature within 5-10 minutes compared to lighting charcoal grills that take about 30 minutes to warm up. Lighting a gas grill is really simple but there are a couple safety precautions you want to be aware of before getting started. First, make sure you lift up the lid on your gas grill before you do anything. This will ensure the gas doesn't have a place to fill up and can escape out the top of your grill. 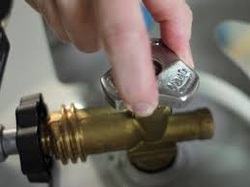 This can help prevent a large amount of gas from collecting inside the grill before you go to light it. Next, locate your ignitor button on the gas grill. Ignitors create a small spark that will catch the gas burners on your grill on fire to light them. Most gas grills will come equipped with an ignitor button but these do tend to wear out over time and stop working. We recommend purchasing a few long matches to have them on hand just in case your ignitor doesn't work. 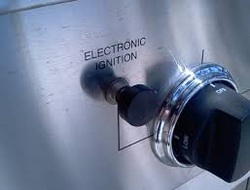 Now that you have identified where your ignition button is, turn your propane gas tank on by turning the valve counterclockwise to open it up. Open the propane tank all the way open and then push the ignitor button to light it. Make sure you aren't leaning over the grill as a gas cloud may ignite and create a large flame. If your grill isn't lighting, you may need to light one of your long matches and put it near the bottom burners on the gas grill. Some grills have a small hole in the end where you can stick the match in this case. If your grill still won't light, you most likely have an empty propane tank and you will need to refill it. Each time you are done grilling, make sure you always turn your propane tank off by turning the valve all the way back to the clockwise or closed position.